Yesterday, I spent a whole afternoon at the Gustav Klimt Experience in Rome, an electronic, immersive display of the Austrian painter’s major works. I soaked up the cultured atmosphere of late nineteenth and early twentieth century Vienna through paintings, pictures and music. I was immersed literally in Klimt’s work, as his paintings were projected onto the walls around, as I sat in the middle of the hall, bewitched and completely unaware of the passing of time. Whatever information and knowledge I took in came to me through sensation, emotion, music and images, only seldom through written words. I noticed how Klimt’s work evolved, spanning three phases: from the earliest classical themes, to the golden symbolism, to the expressionist jubilation of shapes and colours. 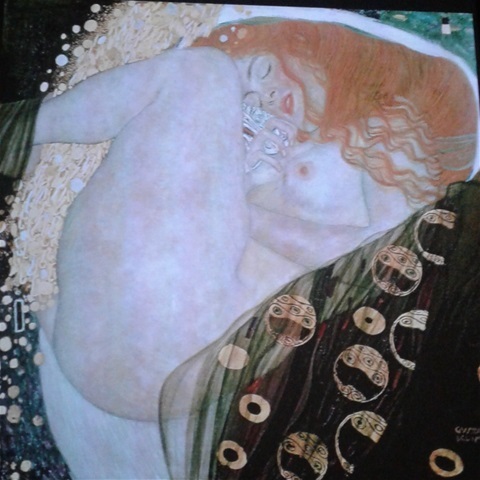 Klimt found himself uninteresting and was spell-bound by women, feminine shapes and nature. Well, I certainly admire those words. Yet, I care both about who and how many like my work – within reason. I can’t help but think that Klimt – and other great artists and writers of the past – would have felt the same, had they lived in an age of digital opportunities such as ours. Nonetheless, I admire his integrity and fearlessness as an artist. He suffered bouts of self-doubt and went through a major personal crisis, yet making art was his life and he persevered. His sensual feminine figures, his love of water and women seem more relevant than ever today; to him the two were closely allied and were the source of all life: physical and spiritual. My yearning for beauty was satisfied in his sinuous paintings, which, however, never eschew the foreboding of decadence and death. Yet, his work celebrates life and beauty because of and in spite of death.